You are in luck! You found the best SEO agency in Edinburgh But what makes us special? Unlike other SEO companies in Edinburgh, we DO NOT outsource SEO to third parties – You hire us, so you get us! We here at Teckle Digital are a specialist SEO company in Edinburgh with clients from all over Scotland and the UK. We have over 13 years of experience in delivering top rankings on Google with our SEO services. We pride ourselves on providing SEO that is transparent and reliable for getting results. Unlike many other agencies, we don’t believe in cookie-cutter or cheap SEO packages. We offer a data-driven approach to SEO, Social media and Adwords PPC (pay per click). This gives us and our clients an edge over the competition and the main reason we think we are the best SEO Edinburgh agency. Our affordable SEO services are all custom to each business that we work with, the same goes for our SEO Glasgow. This means progress and results come faster and you only pay for the services that are backed by data to work. Get in touch today for a free consultation. Over the last 13 years, we have been able to help hundreds of businesses with SEO. 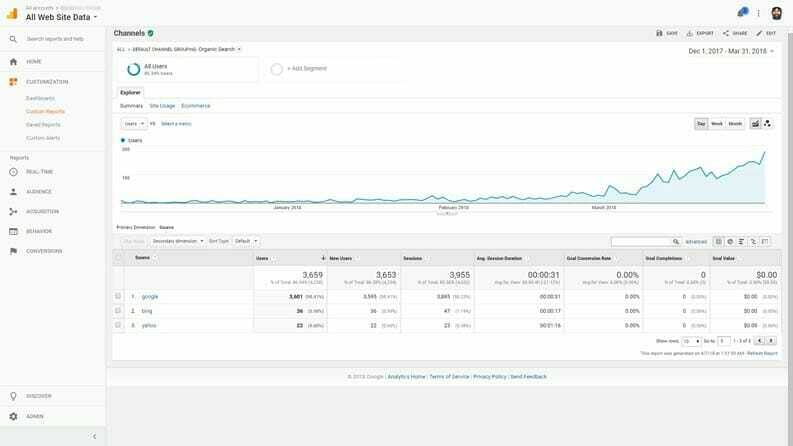 These results are Google search positions and organic visitors but rest assured the main data we measure to ensure our services are working are sales, leads and more importantly ROI. Our agency knows how difficult it can be for businesses to get to page one on Google and other search engines. This is why we have developed a completely transparent SEO service which is 100% data-driven. We track, compare and analyse over 600 ranking factors and using our in-house processes we can construct a plan of action which shows us exactly why your not ranking high and why your competitors are. Based on these finding we can then estimate progress, future website visitors and your ROI. During our initial free consultation, we provide you with this analysis in a spreadsheet (these spreadsheets are massive!) as well as a blueprint of how exactly we plan on getting you the results that you are aiming. Taking a website from nowhere and achieving Page One results on search engines isn’t an easy or quick task. In most cases, it takes months of well planned and executed tasks which when combined provide the foundation of a healthy and successful SEO strategy. We are often asked what it takes to get a website to increase it’s organic search engine positions and there isn’t simply a one size fits all answer. Every website is different and every business is looking for different keywords and goals to be achieved. This is why we don’t provide generic SEO Packages as no two websites will need the same tasks to gain page one positions. No reputable and honest SEO agency in Edinburgh would provide a quote without having performed a complete website audit. The below list isn’t a full list of what we do every month for our clients but it’s certainly a start! As we mentioned above getting a website to rank higher in Google and produce a return on your investment isn’t a quick or easy task. As a trusted SEO agency, we have to take into consideration everything from previous optimisation work, content on the website, the structure of the website and even the design that your website uses. Google’s job is to ensure everyone gets the answer to their question as fast as possible. That means if your website is causing issues due to its speed or doesn’t work well on mobile then it will count against you. At Teckle Digital SEO Agency we have developed a process that means we can quickly audit the current state of SEO and then provide a tailored-to-you plan of action. This action plan is designed to get the best results as fast as possible for your chose keywords. This also comes with estimated time frames, traffic and revenue reports. Assuming you have previous data to base new numbers off of, of course. This is a process we have been providing businesses in Scotland and across the UK for over 13 years with great success. Oh, and we do all of that during the consultation process and free of charge. Something we always hear from our clients is they love how much time we spend during the free consultation as it proves that we don’t just know what we’re doing but it proves that we understand the business goals. We don’t do boilerplate quotes or emails. Every single digital marketing quote that we provide is 100% customised for each client. 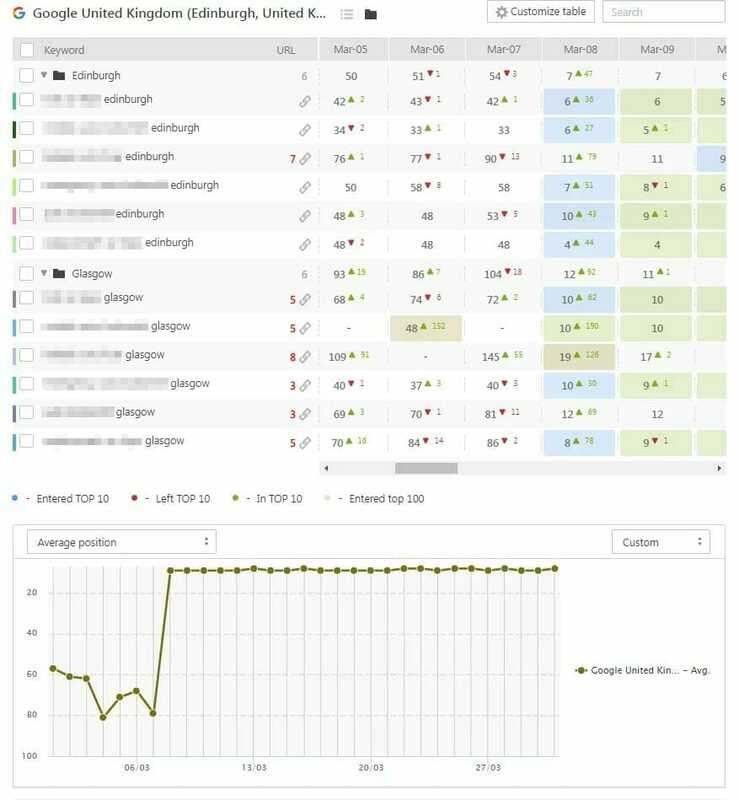 In over 13 years of helping businesses in Edinburgh, we have NEVER come across two that needed exactly the same SEO service. During the consultation period, we aim to get as much information as possible about your business, goals and previous SEO you may have had. This consult gives us the information we need to formulate a list of measurable goals. During this consult, we will also talk through the technical and content Audits that we have completed beforehand. Soon after the consult, we will provide you with a full and through quote based on everything we had agreed during the consult. Once we have agreed to terms, we get started. The first month of SEO is based on everything we discussed during the consult, our over a decade of experience and what we both feel is the best course of action. This consists is ensuring we fix any clear breaches of the Google guidelines, all technical SEO issues and start moving through the major content tasks. As soon as Google has seen the changes we have made we go from experience and evidence-driven SEO strategy to a completely data-driven one. At the end of the day why on earth would we ignore the data, Google gives us when we make changes. If we had some tasks planned but the data we get from Google points to other changes being more likely to increase your positions faster then the plan will move in line with that. This is how data-driven SEO works. You will have access to daily updated tools which provide as much information as we can possibly need for measuring the progress of the SEO service. We also like to schedule a monthly or bi-monthly meeting (or call) to review progress and ensure everything is going to plan. This is actually more important when we get ranked high as it is the key opportunity for us to measure just how much of a difference SEO has made to your business and if there are any CRO (conversion rate optimisation) tasks that we should be looking at. Note: For the most part our CRO services are included in the SEO retainer. After all, you’re paying us to increase your business through Google and that is exactly what we aim to do. We are always looking at ways to maximise your ROI through both SEO and CRO. An SEO Agency with a record of getting results! Simply put we get results for our SEO Edinburgh clients. We have helped hundreds of businesses around Edinburgh do exactly what you’re looking for. Getting more business from online! That may be with SEO or it might even be more cost effective to run paid advertising on Google Adwords. When you contact us we will provide you with a breakdown of what we see as being the most viable marketing opportunities for your business and budget with a break down on costs, timeline expectations and expected ROI. We’re not a generic and faceless SEO agency that “guarantees” you specific positions for keywords because no ethical SEO agency would do that! We’re the type of agency that gets you measurable progress through increased traffic from search engines, increased leads and most importantly increased revenue. Many of our clients tell us that they have been let down previously by another digital agency in Edinburgh. The most common complaints seem to be a lack of communication and the impression that the agency will only do work a few days before the next retainer payment is due. Something you won’t experience with us! Why Choose Us For Digital Marketing? We have been providing SEO & Web design since 2006 - 13 years! Daily SEO updates, weekly traffic & lead audits and monthly progress reports - all at no extra cost! A track record of getting results - Every client we worked with for longer than 3 months in 2017 achieved page one results! Monthly face-to-face meetings available at no extra cost. Constant communication with emails, phone calls and even SMS messages if that is easier for your business! Local SEO is a specific service that we provide to companies that want to rank higher for keywords with geographic locations in them. For example, you will have likely found us by searching for SEO services Edinburgh on Google, we have helped many businesses over the past 13 years. Both of those searches will bring up a Google map result with 3 listings, this is called the three-pack. Many years ago it used to be 7 listings but now that it is 3 listings it is competitive. Our Local Edinburgh SEO service specifically combines optimising for both normal organic search results with optimising for the three-pack. As of 2019 all of the Local SEO clients that have been with us for more than 3 months are featuring in the three-pack. Getting your business featured in the three-pack alone can produce results well in excess of what many expect. 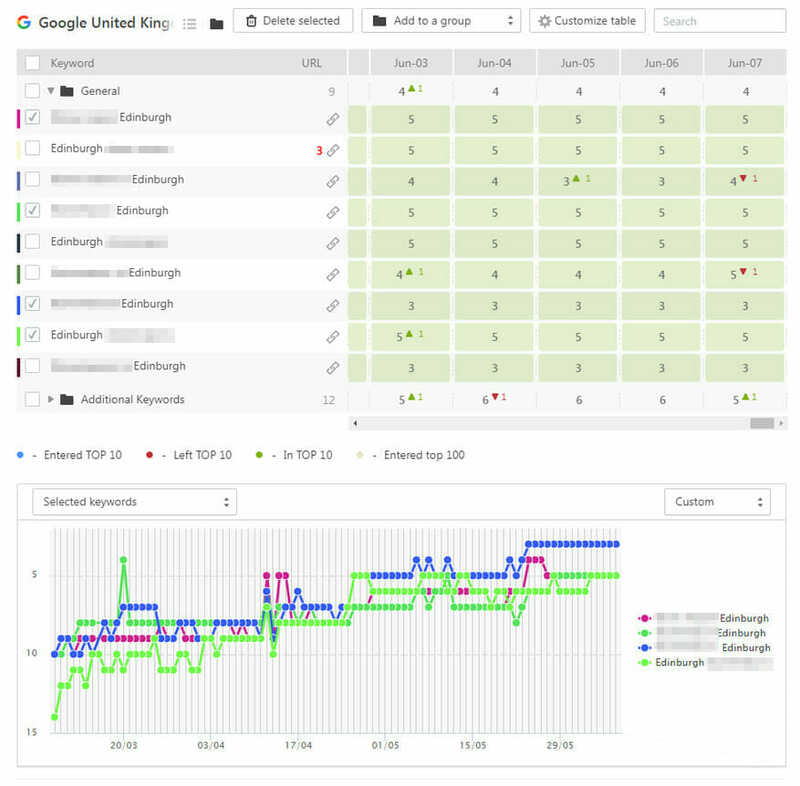 This is the sole reason we advocate pushing local SEO for small businesses around Edinburgh as it will have a profound effect on your sales and leads. Getting your brand in front of new potential customers isn’t just about ranking high on Google search results. Social media and digital marketing can be used to both nurture your existing customers as well as reach potential customers who may not be looking for you on Google. There are generally two methods we use for social media marketing. The first is a more natural process which involves creating shareable content on a consistent basis which is based on promoting what you do in an entertaining and informative way. This will help grow your social accounts as well as increase general brand awareness. The second option is to run a paid advertising campaign on the likes of Facebook and Instagram which is structured towards a specific set of products or services that you offer. Using data-driven techniques and targetted demographics we can ensure your products reach the type of people who are most likely to purchase. Well, I’m completely bewildered by the “black art” which is SEO! I own a business in the very competitive Motor Industry and just was not getting noticed anywhere on the internet and so I began my search for help! I came across Teckle Digital a company I was not familiar with but I had a good feeling with after reading through their website. I was looking for a company that was small enough to care about my business but big enough to perform! I contacted Nathan and he instantly filled me with confidence and so we began talking about various things that would get me further up the search. We agreed a term there and then and within days, yes I mean days we were seeing results from rankings, website traffic and even new customers calling! Fantastic Job done by Nathan and his team! Great web developers. A high standard of technical expertise and a very good level of delivery on times, dates and budgets. Highly recommended. Teckle Digital have been our web design and search engine company for 9 years now. Our website performs much better. Teckle Digital have always been responsive to changes and suggestions from myself.